St. Joseph's Day Means Pastry Day In Providence Italian-Americans celebrate St. Joseph's Day on March 19 with a traditional pastry called a zeppole — a specialty for a family bakery in Providence, R.I.
Italian-Americans celebrate St. Joseph's Day on March 19 with a traditional pastry called a zeppole — a specialty for a family bakery in Providence, R.I.
Today, Italian-Americans around the country are celebrating St. Joseph's Day. There's a luscious pastry associated with this holiday, and reporter John Bender of Rhode Island Public Radio tells us all about it. JOHN BENDER, BYLINE: In the kitchen at LaSalle Bakery in Providence, R.I., a state where zeppole are famous, a team of bakers furiously prepare. They know lines will be forming to snap up this seasonal treat. MIKE MANNI JR.: Right now they're topping the zeppoles. So the same cream that's inside they're putting on the tops. MANNI JR.: For extra calories (laughter). BENDER: Mike Manni is a baker and the owner of LaSalle Bakery, zeppole, or zeppola singular, a kind of super deluxe cream puff. Here you can get your zeppole baked or the traditional way, fried, says Manni. MANNI JR.: Right, dad? Fried was the original way of doing them, right? BENDER: LaSalle Bakery is a family affair. Manni's father, also Mike, owned this shop until his retirement a few years ago. Now the elder Manni only comes in when they need ringers like today. Zeppole are finished off with a dusting of powdered sugar and a maraschino cherry. They're then laid onto crinkly white papers. Bakers then slide tray after tray of zeppole onto racks, ready to be sold. LaSalle Bakery's been churning out thousands of these bad boys each March since 1932, for years piped out by hand, now by machine, says Manni. MANNI JR.: So whether you're doing it with a machine or by hand, there's absolutely no difference. It's just you don't get carpal tunnel syndrome in your hand. BENDER: The treat became famous in Italy then traveled the Atlantic with waves of Italian immigrants, many of whom settled in The Ocean State. But Manni the elder says it doesn't take a saint to get people to eat good food. MANNI SR.: Everybody celebrates around food. So when you have the right mix of a quality product, a celebration, then, oh, it's St. Joseph's Day. Let's eat a zeppola. BENDER: Standing in line, waiting for a zeppola, June Spencer of Lincoln, R.I., agrees. She says it wouldn't be St. Joseph's Day without one. JUNE SPENCER: It's just a tradition. It's an Italian pastry. And it's part of the celebration of St. Joseph's Day, you know, at a big Italian dinner. And it just makes it more festive. BENDER: If all this is making you hungry and you want to get to your nearest bakery, better call ahead. Zeppole are popular, sell out fast and are hard to come by. For NPR News, I'm John Bender in Providence. As they travel the parade route, tuxedoed men and youths distribute strings of colorful beads, dried fava beans and genuine Italian kisses. The St. Patrick's parade is over and the Irish (and honorary Irish) have gone home to sleep off their annual bout of intemperance, but the multi-generational marchers of the Italian-American St. Joseph Society in New Orleans are only just dusting off their tuxedos and straightening their bow ties. Once the shamrocks and shenanigans have vanished from the narrow streets of the French Quarter, and the keg of green beer is empty, another parade — in honor of an entirely different saint — is beginning to gear up. Every year on the Saturday nearest March 19, Italian-American Catholic revelers flood the streets in honor of the Feast of St. Joseph, the patron saint of Sicily. The differences between the St. Patrick's Day festivities and the St. Joseph's Day parade are unmistakable. Instead of green, St. Joseph's marchers wear red. Instead of shamrocks, they carry lucky fava beans. The parade in New Orleans is rooted to a reverent, yet humble start: In 1970, a single pickup truck honoring St. Joseph trailed behind the yearly Irish Channel Parade, according to Mark Fonte, historian for the St. Joseph Society. 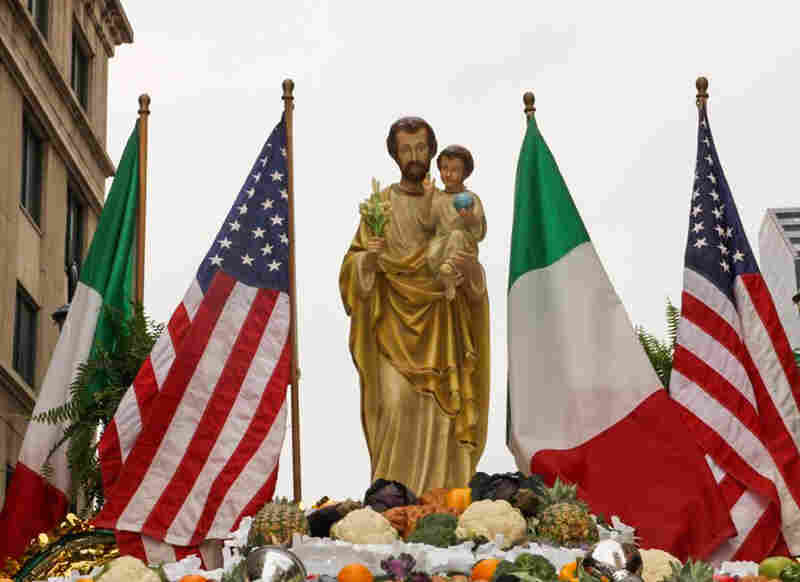 But the Italian-American community in the city longed for a public way to express their heritage and appreciation for St. Joseph, husband of the Virgin Mary and foster father to Jesus. Every year, on the Saturday nearest March 19th, a parade and meal steeped in Italian-American traditions honor the feast day of St. Joseph, the patron saint of Sicily. In the early 1970s, the society petitioned for their own parade. "It was around the time that the first Godfather movie came out," says Fonte. "It gave us a big boost. Everybody wanted to be Italian." There are St. Joseph's celebrations across the country — and the world — but none so big, bold or festive as in New Orleans. This year, more than 300 marchers and 11 floats will trek down Chartres Street, past the green-shuttered building where former New Orleans Mayor Nicholas Girod offered his residence as a haven to exiled Napoleon Bonaparte in 1815. Leading the procession is a rolling altar bearing Italian food and relics dedicated to St. Joseph. Many local Catholic churches, families and stores also construct altars. The St. Joseph's Day parade route takes a veritable stroll through French Quarter history. And though Creole culture is now uniquely synonymous with the modern New Orleans tableau, Fonte explains that there is a storied history of Italian heritage in the French Quarter. In the mid-19th century, thousands of families immigrated to the United States from Sicily, many traveling the long, arduous route from the capital city of Palermo to the bustling port of New Orleans. Desperate to escape famine and political turmoil in Italy, many immigrants settled in the lower French Quarter, establishing their own tiny enclave — known as Little Palermo. According to Fonte, the celebration of the Feast of St. Joseph was one "tradition that came over with these immigrants — and it just stayed." During the Middle Ages, legend claims, Sicily was in the midst of a great drought. The desperate citizens prayed to St. Joseph, beseeching him for rain. Amazingly, one crop endured to sustain them: the hearty fava bean. When God sent Joseph to grant them rain and the drought ended, the grateful people of Sicily vowed to honor their blessings each year on March 19, the Feast of St. Joseph. Historically, throughout small towns in Sicily, a communal meal was held near the center of town to celebrate St. Joseph's Day, where food donated and prepared by the wealthy was shared with those less fortunate. In some U.S. cities, opening up your home to the neighborhood and the poor is still part of the celebration. As they travel the parade route, tuxedoed men distribute symbols of both their history and their present: strings of colorful beads, dried fava beans and genuine Italian kisses. At the end of procession, the crowd gathers at a local hotel for a ball where old customs and modern tastes fully converge. Families pass around bottles of hearty table wine and the band strikes up a Louis Prima tune. The couples dance the Tarantella. And together, they all feast on a mountain of local New Orleans muffuletta. In the middle of Susan Vacarella's living room is a three-tiered altar to St. Joseph built to rival any in New Orleans. More than 8-feet wide and 10-feet long, it's taken years of fine-tuning to fashion a shrine glorious enough to entice more than 100 family and friends to bask in its magnificence. 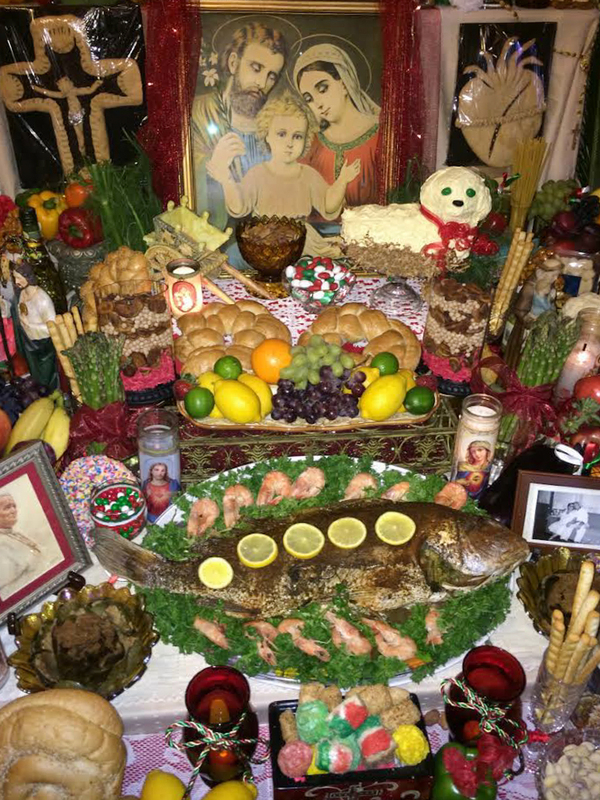 The Vaccarella family's altar to St. Joseph is a grandiose three-tiered shrine decorated with traditional foods, religious symbols and photos of loved ones. Although many people in New Orleans create altars to celebrate the Feast of St. Joseph, there are few as extravagant as the Vacarella's. Susan's husband, Morris Vacarella, says it was inspired by the one he remembered at his grandparents' house while growing up in the 1940s and '50s. Many of the relics have a poignant, personal meaning. The faded painting of the Holy Family hails from his grandparents; a friend donated the tall wooden statue of St. Joseph from a mission trip to an Italian convent. After Hurricane Betsy swept through New Orleans in 1965, Morris Vaccarella's grandparents no longer could muster up the energy to create such a grand display. But Susan Vaccarella was ready — and willing — to carry on the family tradition. "I had it in my heart to bring it back one day. Our altar really began in honor of them." Over the years, the Vacarella's altar has become an amalgamation of Italian-American tradition and contemporary New Orleans soul. There is the platter with the large scaly fish, representing Jesus, which is adorned by 12 plump shrimp, which, although interpretations vary, most likely represent Jesus' apostles. There are wreath-shaped loaves of bread (representing Jesus' crown of thorns) called Cuchidati and thickly glazed cookies, a reminder of the fig trees that dominate the landscape of Southern Italy. Pasta Con Sarde, a traditional spaghetti dish made with anchovies and sprinkled with breadcrumbs, is the main dish. The breadcrumbs symbolize sawdust — a tribute to Joseph's career as a carpenter. The guests make personal petitions to St. Joseph and the food on the altar is blessed. Finally, they share in one ritual that's essential to any Italian-American celebration: "We eat all afternoon," says Susan Vacarella. There is an old Sicilian legend that states that if a single, unmarried woman pockets a lemon from the altar of St. Joseph when no one is looking, she will wed by the time the feast day rolls around again. But Susan Vacarella conveys the legend in another way. "If a woman steals a lemon from the altar, she will soon have a baby," she explains with a laugh. "You have to put it under your pillow. That's how it happens." Pasta Con Sarde is a spaghetti dish made with anchovies and sprinkled with breadcrumbs, which symbolize sawdust — a tribute to Joseph's career as a carpenter. Frosted white lamb cakes are also traditional. Nestled on the Vacarella's St. Joseph's Day altar, between the tempting, lucky lemons, the platters of plump N'Awlins prawns and frosted white lamb cakes, are framed photos of deceased family members, including Morris' grandparents. The Vacarellas encourage guests to pen a short tribute to their loved ones and post it on a board near the altar. 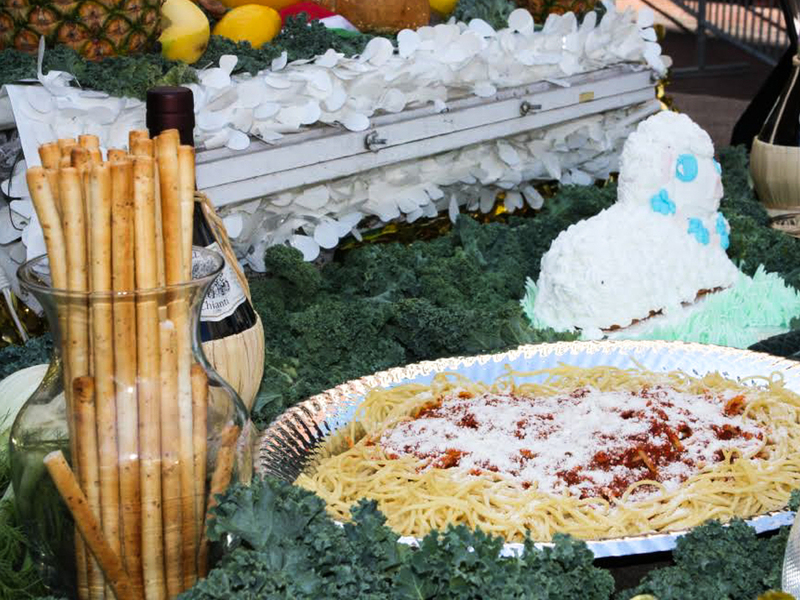 The parade, the feast and the altar are ways for Italian Americans to trace their family's historic journey, along with honoring St. Joseph, who is also the patron saint of dying a "happy death." 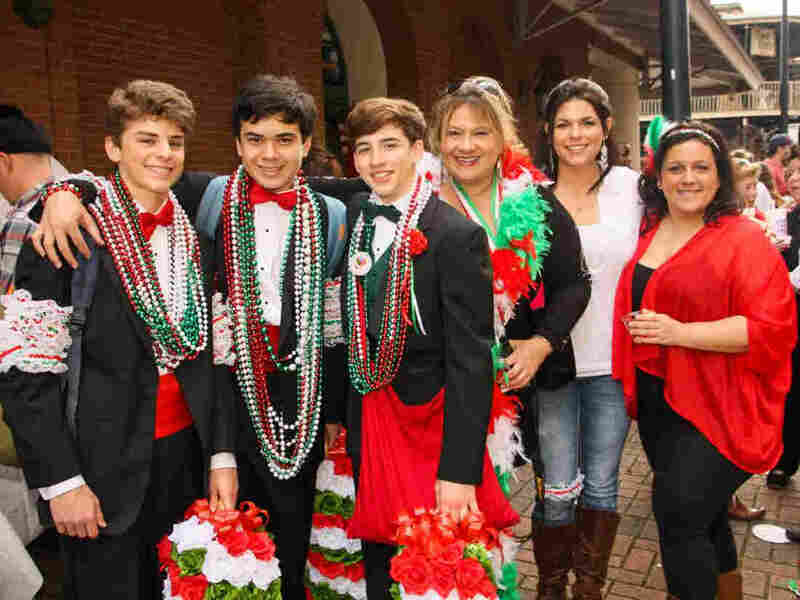 St. Joseph's Day in New Orleans is a tradition woven out of diverse fabrics. It is a celebration of grateful abundance and a modern retelling of an old-world legend; it's a feast of the senses and a religious homage to a beloved saint. But threaded into the story of the big parade and meal is a long-raveling historical yarn of the resilient immigrant spirit in America.